Adding to its netbook range, Elonex has released the Websurfer Connect. With its outdated chassis, usability and comfort are around two years behind the current standard, but a built-in VoIP phone has been included to make chatting over the web quick and easy. The phone is embedded to the right of the screen. 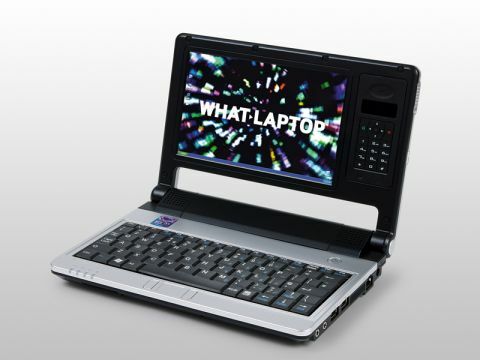 It connects wirelessly to the netbook via Bluetooth and charges when docked. The machine's user manual talks you through setting up a Skype account – which is a VoIP service provider – and you'll soon be chatting away over the web. The system was easy to set up, worked well and should prove useful to those who regularly use the phone. But the handset is ergonomically unfriendly and features a tiny screen which is irritating to use. While Elonex is marketing the above as a new and pioneering way to do business, this system is old and was implemented by Packard Bell roughly two years ago. The 7-inch netbook screen is very poor. Colours are washed out and detail is seriously lacking. It is touch-activated, however, giving you a greater degree of interaction with the machine, and can be opened up to 180 degrees giving you a wide choice of viewing angle. The keyboard is cramped and provides a poor typing experience, but the touchpad is even worse and so small and unresponsive it proves almost unusable. A VIA processor is in place with 1024MB of memory. Performance is sluggish, with even basic multi-tasking proving difficult. A 30GB hard drive provides enough room for basic applications and office-based documents, but no more. Portability is average, with the battery lasting just 201-minutes. A DVI port lets you connect an external digital monitor, while two USB ports and an SD card reader round off the specifications. The Websurfer Connect is a poor netbook with a terrible user interface and sluggish performance. The VoIP phone redeems it somewhat, but certainly not enough. Please avoid.